- Almond/cashew/peanut/madadamia OR sunflower seed butter (spread liberally on the apple rings)- all of which are available at most large supermarkets or good health food stores if you don't want to make your own. - Dried fruit (my kids like raisins, chopped medjool dates, goji berries, dried blueberries, cranberries), cinnamon, dessicated coconut or toasted coconut flakes, flaked almonds, chopped nuts, cacao nibs, sunflower, pumpkin, hemp or chia seeds or anything else you can think of! 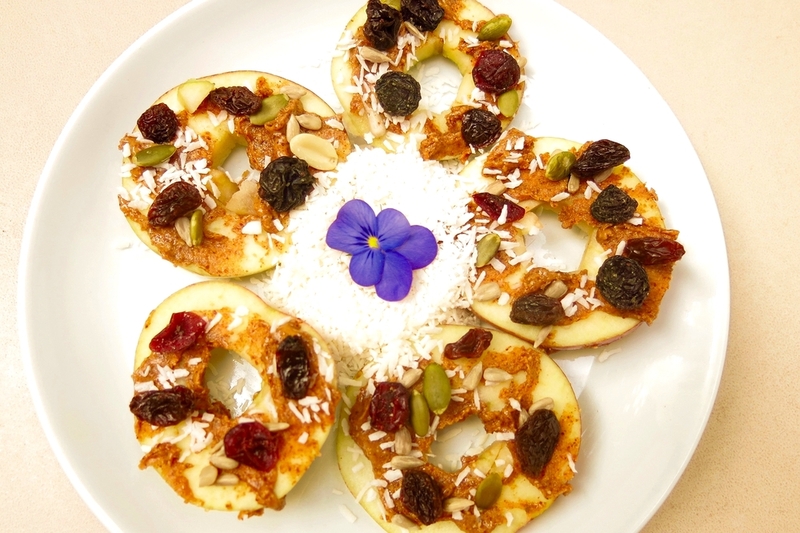 - Get creative and let your kids decorate their own healthy snacks. My daughter made these ones - who knew apples could make such pretty flowers!